Merry ho ho ho! How about an abbreviated Newsletter this week? I want to be on a real break... I don't want to spend all day here. As I was scrolling through the teams, alphabetically, I was thinking that we were going to have ourselves a good tie-breaker for a couple of players at 7 points a piece, both Claude Giroux of the Flyers and Ryan Getzlaf of the Ducks were up there hunting for the honour, but once we got to Troy's team, we saw James Reimer was there with 8 points and then the title was his! Reimer finished Week Twelve with a 3-0-0 record, which included a shutout, giving him his 8 points. It was wins against the Coyotes on Tuesday, the Wild on Friday and then he ends up shutting out the Senators on Saturday night, capping off his week, playing back-to-back nights. It hasn't been a particularly great season for Reimer, getting off to a slow start, thanks to being the number two guy behind Roberto Luongo and then an injury-plagued Panthers team had its share of troubles just trying to find wins. In 23 appearances this season, Reimer now has 9 wins and 1 shutout for 20 points, only good enough for 187th overall in pool scoring. This is Reimer's first Player of the Week nod in the hockey pool and this is Troy's third Player of the Week, since he joined a few years ago. Troy had taken Reimer with the 78th pick in the 4th round, so this honour doesn't quite make up for the bust pick. Four teams finished atop the weekly scoring ranks, as Dale B., Kristy & Don, Clayton and Cam all finished with 31 points a piece, so we'll have to go to the goals scored tie-breaker to find our weekly winner. Topping the list, with 11 goals, it was Cam's team that got the Christmas break Mover & Shaker nod. Dale was the closest team to Cam's with only 8 goals scored in the week, the other two teams in the week each had 7 goals. 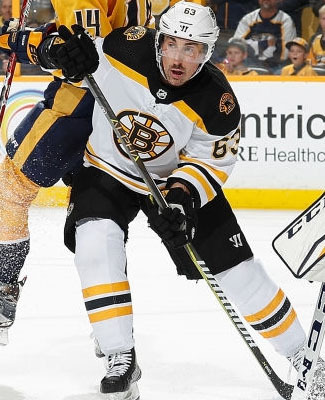 Tops on Cam's team was Brad Marchand of the Bruins, who finished with 5 points. Also having a good week was Waiver Draft pick-up Jake DeBrusk of the Bruins, who had 4 points, while three more players had 3 points a piece. In total, 13 of Cam's active 14 players on his team all finished with points, the only one who didn't get a point, Bo Horvat of the Canucks, who is out with a fractured foot. The big week lifted Cam's team up from 13th to 11th place in the standings and since the new players have been activated from the Waiver Draft, his team has moved up from 15th, making gains every week. Since the start of Week Ten, Cam's team ranks 3rd in the pool in points, with 85 points, only 4 points back of Dale B. for the segment lead. This week's Mover & Shaker win was Cam's 4th nod over the last four seasons, but the first three nods saw his team up in the money conversation, only before a collapse in every season to fall well down in the standings. Maybe this year, starting from the middle of the pack might get his team up a little bit of higher, with some extra momentum from this top week. There wasn't any sort of tie-breaking procedures needed for the Basement Dweller, as Grant finished with 14 points, 2 points clear of anyone else. Grant's team was really making some headway in recent weeks, as his team got off to a slow start, but climbed its way up to the top 10. With this Basement Dweller nod, his team fell from 9th down to 13th place. Eight of his 14 players had points in the week, but six of those players were tied for his best total of only 2 points. There were a couple of injuries on his team, but there was just a lack of big individual efforts that would have kept his team out of the dark. Grant only made one change at the Waiver Draft and his team hasn't quite found its stride in the second segment of the season, ranking 21st since the start of Week Ten. The top three teams in the standings didn't change in Week Twelve, Dale B., Wilton and Jeremy all continue to hold onto the money spots, Dale's team extended its lead to 6 points. Five teams have now eclipsed the 300-point mark now and they are all within 14 points of each other. Benson and Kristy & Don are knocking on the door and one good week can still change the complexion of the top three in a hurry. There were no new eliminations in the goalie survivor pool this week, leaving us with three teams still vying for the title. Grant, Jeremy and Wilton all will compete again, starting on Wednesday night. Despite the short week, all three teams have six projected games for their goalies. Another brutal week in the plus/minus department, as the entire pool was a combined -55, a new record for futility. I was thinking that -40 in Week Three was going to be the worst, but the pool really knocked that one out of the park. Steve's team continues to survive at the top in this mini-game, with a +11 rating in Week Twelve and now going back in the lead with an 11-point gap between his and Cam's team. Scoring was up, but participation was down. That's all we really need to know. The Buffalo Sabres were without forward Ryan O'Reilly on Saturday night, as he was dealing with some personal matters away from the team. There was no immediate update on whether or not he'll be back in time for the opening up the schedule again. The Sabres open up out of the break in Brooklyn against the Islanders. It's just another man-game lost for Wes' team, which is tied 18th in the pool in skater games. The Columbus Blue Jackets are planning to be without forward Alexander Wennberg by the sound of things. On Saturday night against the Flyers, Wennberg wasn't dressed for this one, due to an undisclosed injury and the coaching staff suggested that he was going to be out for a while. The Jackets will open up their schedule against the Penguins on Wednesday, so we're hoping to hear more before then. Brenda & Seward are now waiting with bated breath to see if their player will be back outside of the holiday break. Their 17th place team isn't going to climb up the standings without a guy like Wennberg in their lineup, so they need him back sooner, rather than later.